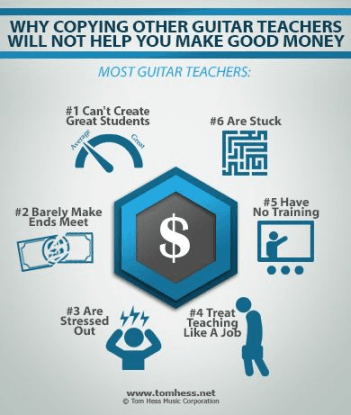 Understand the true reasons why most guitar teachers don’t become successful. Learn exactly what to do to attract more students, help them become better guitar players and build a strong reputation throughout your area. Actually do the things that make you successful. 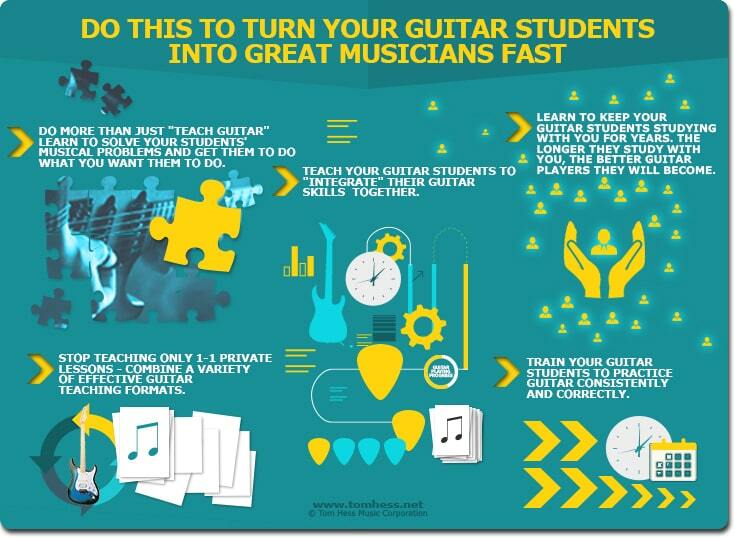 Many guitar teachers don’t know how to help their students reach their musical goals. This happens because many teachers have little to no training on how to teach guitar. Most learn to teach through trial and error or by copying other guitar teachers. What do you think happens if you copy the way most teachers teach their students? Answer: Your guitar students get the same results and you develop the same reputation that most other guitar teachers have. When you stand out as the best, most skilled teacher in your area, attracting a lot of guitar students becomes easy. Action step for you: Commit to becoming the best guitar teacher you can be for your students and develop the skills you need to get there. Myth #1: You will fill your teaching schedule faster by charging less money for lessons than other teachers. Reality: This strategy may work in the short term, but in the long term it hurts you more than it helps you. Students who are motivated by cheap guitar lessons often don’t stay committed to lessons long term. Myth #2: “It’s better to promote yourself as a teacher for all styles, ages and skill levels, in order to attract more students”. Reality: The most serious guitar students seek out expert guitar teachers who specialize in the exact style they want to learn. Reality: There are guitar students looking for lessons every single month of the year. You can attract a lot of new students during the summer if you do not stop your marketing efforts like most guitar teachers do. Action step for you: Build your teaching business based on the strategies the most successful teachers use - not on myths that most other guitar teachers believe in. Discover how to make your guitar teaching business more successful. Most guitar teachers earn a lot less than they should because they teach private 1-1 lessons. Your income is always restricted by the amount of hours you can teach. Your hourly income is always limited by your hourly lesson rate. Teaching guitar becomes overwhelming, because you have to work a lot of hours just to earn enough money to live on. Most teachers also spend time doing things they never get paid for, such as: chasing students for late payments, teaching makeup lessons, preparing lesson materials and doing administrative issues. This leaves you with little time (and energy) to work on improving your teaching skills or do other things to increase your income. Action step for you: teach your guitar students in groups (at least some of the time). This frees up your schedule, helps your students develop the skills they can only learn in group lessons and allows you to earn more money. Most guitar teachers don’t think about teaching guitar as a business - they treat it like a job. This means they do the work of teaching guitar lessons… but do little to actually grow their business. At a job, you only make money while you work... you stop getting paid as soon as you stop working. A business earns you money whether you are there or not. This means your income is not limited by the number of hours you can work. It also means you can help a lot more people become better guitar players. Action step for you: Think of yourself as a business owner and not just a guitar teacher. This mindset shift helps you take the right actions to earn as much money as you want to earn teaching guitar. Many guitar teachers don’t earn a lot of money simply because they don’t think it’s realistic (for them) to do so. They see other teachers around them not earning much and think that this is how life is when you teach guitar. Truth is: building a successful guitar teaching business is no different than building any other successful business. You have the same income potential as any other business owner. Action step for you: Use the tips in this article to improve your teaching business, so you earn a lot more money than most guitar teachers. Want to learn 5 proven ways to get people who contact you to start guitar lessons with you? Download this free guitar teaching eGuide and learn how to have a full schedule all year long, no matter where you live. Get guitar teacher training and learn how to earn tons of money with your guitar teaching business.